Interesting that they are doing an active de-orbit. 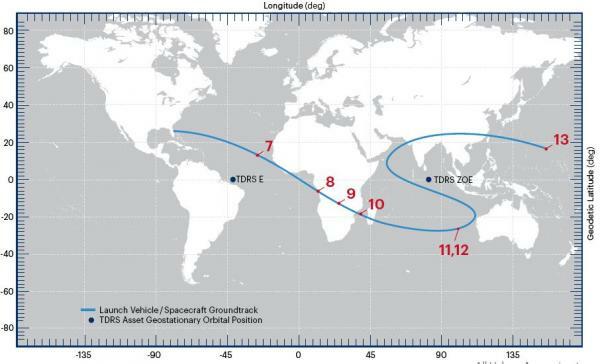 If they instead used a lower perigee (they are using 433 km), then the second stage would de-orbit naturally. Then the delta-V used for de-orbit could have been used for inclination reduction, decreasing the fuel needed by the satellite and potentially extending its life. So I'm somewhat surprised they are doing this - it's unusual for GTO missions. Was the quick de-orbit required by the customer? Or they specified a perigee sufficiently high that more than 25 years would be needed for passive disposal, thus needed active disposal? Or they wanted a very specific orbit, and there was performance left over? Does anyone know the reasoning behind this? There's a small error on the press kit. 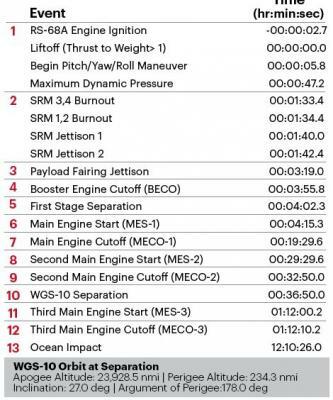 It says that main engine start takes place 2.7 seconds before T0. That's actually when the Atlas V's RD-180 engine lights up. For Delta IV rockets, the RS-68A engine ignites 5.5 seconds before T0. They basically open the LH2 and LOX valves within a few seconds followed by a health check prior to SRB ignition. Interesting that they are doing an active de-orbit. There's mention of a de-orbit burn in the WGS-8 and 9 launch threads. Customer request? 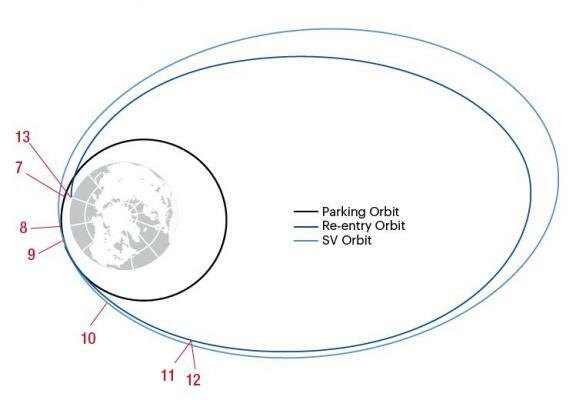 De-orbit burn is needed to meet ODMSP requirements for NSS missions. Atmospheric reentry option: Leave the structure in an orbit in which, using conservative projections for solar activity, atmospheric drag will limit the lifetime to no longer than 25 years after completion of mission. This is what most commercial launches do - by using a perigee between 200-300 km, they re-enter in just a few months or years. No explicit de-orbit burn is needed, and all available performance can go towards giving the satellite the best orbit. Perhaps the customer required a high perigee, from which a 25 year re-entry could not be guaranteed? You left out the relevant part: If a space structure is to be disposed of by reentry into the Earth’s atmosphere, the risk of human casualty will be less than 1 in 10,000. Commercial providers do not have to abide by this policy. FYI, Andrea has recently returned to ULA and will be providing launch commentary. If a space structure is to be disposed of by reentry into the Earth’s atmosphere, the risk of human casualty will be less than 1 in 10,000. So to get an FAA license, commercial providers have to meet the same requirements. European providers have a very similar set of rules. I don't know about Russian, Indian, Chinese, or Japanese missions. I think it comes down to commercial providers saying "we meet the EC number", government customers say "not so fast..., here's what we come up with". If you look back the past few years, all NSS GTO-type missions have done de-orbit burns, or met the minimum perigee altitude requirement. NASA missions had the end of life perigee altitude above the minimum requirement. More from LHA embedded in tweet: Back-up launch date is March 15 EDT. EDIT 3/11: Only a launch "two-fer" Soyuz MS-12 and PRISMA. EDIT 3/13: Only Soyuz MS-12. Is it just me or does it seem like just about every Delta IV launch lately has run into some delays due to faults or off nominal readings? Anyone have the stats on that? I know it's a much more cumbersome beast than Atlas but I don't remember there being this many last minute delays for Delta a couple years ago. And is the off-nominal readings from the launch vehicle, the payload, or both? In my humble opinion, the reason for these delays is because the Delta IV hasn't flown as often as other launch vehicles such as Ariane 5. 45th Weather Squadron's L-3 Launch Mission Execution Forecast for @ulalaunch Delta IV Medium+ with the Wideband Global SATCOM #WGS10 calls for 70% of acceptable conditions. Primary concern due to cumulus clouds. Launch window open Friday at 6:56pm EDT and extends to 9:05pm EDT. ULA will launch the 10th Wideband Global SATCOM (WGS-10) on a Delta IV Medium (5,4) on Friday, March 15, 2019. The launch is scheduled for 6:56 p.m. EDT from Space Launch Complex-37 at Cape Canaveral Air Force Station from Florida's Space Coast. WGS-10 is the fourth Block II follow-on satellite and supports communications links in the X-band and Ka-band spectra. While Block I and II satellites can instantaneously filter and downlink up to 4.410 GHz, WGS-10 can filter and downlink up to 8.088 GHz of bandwidth. Depending on the mix of ground terminals, data rates and modulation and coding schemed employed, a single WGS satellite can support data transmission rates over 6 Gbps, and WGS-10 with its advanced digital channelized may support over 11 Gbps. WGS-10 will be with eight flight of the Delta IV Medium+ (5,4) configuration. All launches in this configuration have delivered WGS missions to orbit. This mission will also be the 39th launch of the Delta IV since its inaugural launch in 2002.